I fancied having a go at something that was “raw vegan” and various websites and forums were telling me that a “green smoothie” was the easiest place to start. I was a bit skeptical about drinking green veg in smoothie form, but I have to say that I was pleasantly surprised with the dubious looking cocktail I managed to whiz up. I used frozen mixed berries (blackberries, strawberries, red currants and black currants) in mine, which meant that the resulting breakfast beverage came out more of a browny – pink colour rather than green. Although to be honest I thought that this pale brown sludge looked more appealing than the ones which bear a resemblance to Kermit the frog in a blender. 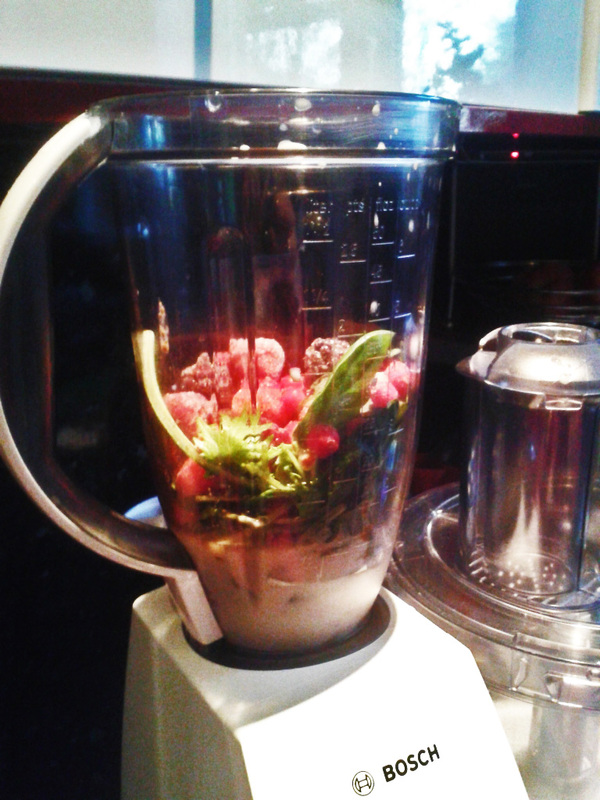 A hint of cinnamon, nutmeg and vanilla helped to make the smoothie rather tasty, without adding any extra sugar. 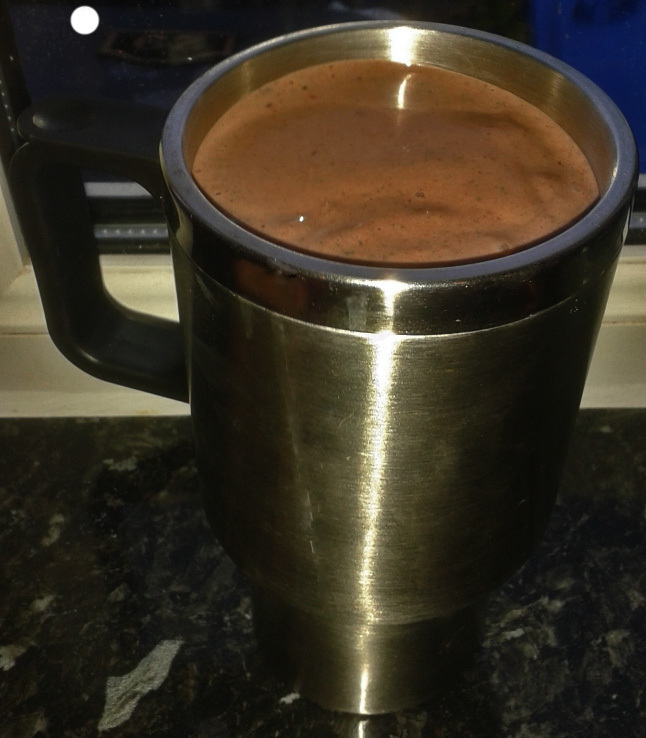 I would describe this power-shake as being rich, thick and satisfying…and somehow almost chocolatey! (In fact, half a teaspoon of cocoa powder might make a welcome addition to the recipe?). Water to thin if necessary. I find that adding the leafy greens into a blender first works best, as it stops the spices and the nut butter from sticking to the blades. Next, add the berries, then the milk, then the spices, vanilla essence and nut butter. Every time I make this recipe, the consistency is slightly different. (Must depend on how many of the little red and black currants are occupying the cup?). Sometimes it blends up like a dream, sometimes you have to give the blender a quick shimmy and a splash of water to thin it down enough to blend properly. It’s also worth remembering that the smoothie becomes less thick as it warms up. So if like me you whiz it up then take to work, it might be worth making it that little bit thicker to begin with. It takes longer to drink than it does to eat a piece of toast or bowl of porridge, and it’s so thick that I found I felt fuller for longer, so no rumbly tummy until lunchtime. Bonus! ← 18. Spicy creamy “mascarpone” and tomato pasta.